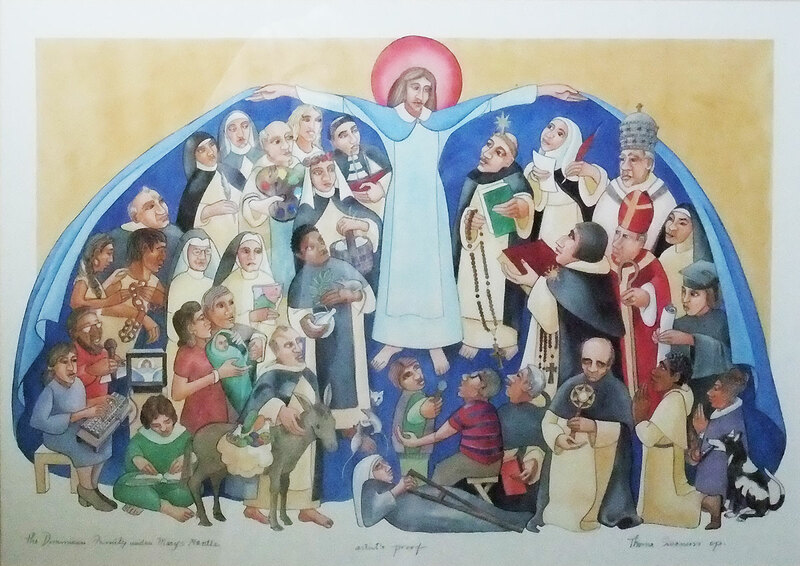 This is a photo of an original print, signed by the artist, of a watercolor painting of Dominicans under the Mantle of Mary, the Mother of God. Following is a description by the author of the people portrayed. Mary holds open her mantle at the request of Dominic who is looking all over heaven for his brothers and sisters. He finds that Mary is sheltering the whole Dominican family, old and new. On the left side is Dominic, praying his rosary and carrying the Gospel of Matthew. Next to him, Catherine of Siena ponders her most recent letter to the pope, and Pius the V, wearing his papal crown, contemplates the scene. Thomas Aquinas is offering Mary his Summa Theologica, while Albert the Great pushes him forward. Below Thomas is Hyacinth of Poland carrying the Blessed Sacrament. Next to Pius is a Chinese sister, and below her an African friar and a contemporary sister who has just completed her education. They represent the vocations that are the gift of God to those who preach the Gospel to all nations. At the bottom right, under the mantle, is Jane of Aza, Dominic’s mother, and with her is the famous dog of her dreams. The sister graduate with her diploma demonstrates the continuing dedication of Dominicans to study and learning. Under Mary’s feet are contemporary friars and sisters dedicated to the use of modern means of communication for preaching the word of God. At Mary’s feet is Margaret of Castillo who attains sanctity as a Dominican after her parents abandon her because of her blindness and physical deformity. On the left side of Mary, with the boat, is Vincent of Valverde, a Spaniard who sailed to Peru as chaplain with the soldiers of the conquest, and heroically tried to save the Indians from the conquerors. Below him is Rose of Lima with her basket of food for the poor. Her Peruvian contemporary, Martin de Porres, is holding herbal medicines while his animal friends look on. Below Martin are his friend and contemporary Juan Macías whose burro knows his way through the streets of Lima to the homes of the poor. Behind Rose is Fra Angelico holding his palette, and behind him, those dear friends of Dominic, Diana and Cecelia. The smiling blonde is a contemporary Dominican sister who somehow got into the back row. The two sisters below them with familiar veils represent the founding members of American congregations. Behind them is Bartolomé de las Casas with his hand on the shoulder of native Americans he is defending Below him are contemporary members of the Dominican family: a couple with their baby, and others making use of advanced technology to record this heavenly event.